The Swedish Gothic/Doom Metal band DRACONIAN released their last album, “Turning Season Within”, in 2008. See my review here. But as each album brought them closer to the international stages and a bigger fanbase, several gigs were obviously played to promote this last effort. DRACONIAN rapidly became one of my favourite bands and the solo stuff of guitarist Johan Ericson under the banner DOOM:VS also is very much worth checking out if you’re into Death/Doom. Anyway, three years later a new album is out since the 24th June: “A Rose For The Apocalypse”. Again the band worked with producer Jens Bogren (AMON AMARTH, PARADISE LOST, GWYLLION, SYMPHONY X, ENSLAVED, TURISAS, and many more), like on the previous album, which means the sound remains recognizable and even similar to e.g. AMON AMARTH’s latest releases. “A Rose For The Apocalypse” contains ten tracks, totalling a playtime of a good hour of Doom, gloom, melancholy, sorrow and sadness. Or, anything a DRACONIAN album should contain and has contained. It all starts with the suspicious/mysterious intro of “The Drowning Age”, after which reasonably fast melodic Doom breaks loose, reminding of AMON AMARTH somehow, but that’s due to the Jens’s productional work. That was only the first part, as proper (i.e. slow) Doom then is selected. Vocalist Anders Jacobsson takes the lead and his brutal grunts work very well with the heavy guitars, while Lisa’s angelic, weeping voice contrasts nicely. A clean break offers the chance for Lisa’s voice to be in the spotlights, supported by accustomed music. Everything grows stronger again afterwards with a rather big Gothic touch now. In short, a typical DRACONIAN song and very good one even. In the slow “The Last Hour Ancient Sunlight” it’s Lisa who sings the lead vocal parts in the clean verses. The melodic input is apparent, incl. symphonic backing. Anders’s grunts are reserved for the chorus, which is heavier and more dramatic, so to speak. It’s a dark and quite brutal track. The ballsiness is broken by a violin moment, a nice move. And the contrast remains intact even when the slow, crushing Doom that follows then makes way again for the clean verses (and so forth). With “End Of The Rope” the Swedes made one hell of a song and big highlight (in my humble opinion) on this new album. A melodic line at first, followed by firm Doom Metal that can only be done by DRACONIAN. This is far from happy music, but it sounds so tasty. The violin accents help to accentuate the feeling of loss or pain, while Lisa’s singing is perfect to vocally express this feeling. Anders creates a wonderful contrast with his grunts. Absolutely stunning material! The piano break near the end comes as a (pleasant) surprise, while the Metal stop as if the plug was pulled. “Elysian Night” is set in in a direct manner. Clean verses with Lisa on lead vocals are opposed to a brutal, yet dramatic chorus where Anders plays a key role. Symphonic backing completes the picture. During the guitar break there’s a spoken part with a piece of”Ode To A Nightingale” by John Keats. The symphonic piece that follows flows well with the heavier Doom, but is also nice to the ears so it’s not only the guitars that need to take care of the melodic aspect. “Deadlight” is a more simple song, which starts with cracking sounds like from an LP/vinyl. A spooky passage comes next, transcending nicely into a more Jazzy part. When heaviness falls in, the overall pace and feel remain the same, however. Grunts are the dominant vocals, angelic singing is reserved for the chorus. Nice to hear too how, before the guitar solo, the band added a powerful bridge where Anders can go all the way with his extreme vocals. The first thing one notices in “Dead World Assembly” is the increase in push, drive, at least in the beginning. The verses are of the slow and acoustic kind. Perfect for soft female vocals. And as you would expect, power and aggression reside in the chorus. Again I have to congratulate the band for how they pulled it off. The aforementioned violin makes a return in the break, together with the acoustic guitar. There’s another quoted part too, taken from the poem “Earth’s Answer” by William Blake. “A Phantom Dissonance” begins acoustically, but this is soon replaced by alarming (so to speak) Doom, connecting neatly with the acoustic verses. The roles are again clear: Lisa in the verses, Anders in the chorus. A Jazzy break comes in later, after which the band continues the regular structure. No complaints from my part, this is another solid song. The cracking of vinyl and/or a radio effect is applied in “The Quiet Storm” as well. Female vocals come in only briefly and in that specific part (comes in a second time much later), grunts take on the rest of this sorrowful song. Even if the chorus contains a good dose of sadness and gloom, the drumming there is quite firm. No direct start in “The Death Of Hours”, rather slow building (with of course enough melody) towards the midtempo verses. Female vocals there, furious grunts and screams in the chorus. A semi-acoustic break is set before the spoken part with a backing organ. And this spoken part contains elements from the poem “Unforgotten” by Laurence Hope. Last but not least, there’s “Wall Of Sighs”, which is another midtempo song full of melancholy, doom and gloom. Vocally only grunts. Later the spotlights are aimed at the violin for its solo. A solid song, but in my opinion not as good or attractive as the preceding ones. 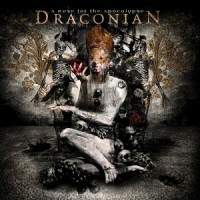 To cut a long story short: you cannot go wrong with DRACONIAN if you’re into Gothic/Doom Metal. They are the best, or among the best, bands in this genre and have once again put out an outstanding album. “A Rose For The Apocalypse” continues where “Turning Season Within” left off, also soundwise. Some songs reminded me of”Arcane Rain Fell” (perhaps the band’s best album?). The vocal input is simply awesome, the music needs no comment and can speak for its own (i.e. it’s amazing), but I also had the impression the guitars sounded heavier than before. In any case, “A Rose For The Apocalypse” is recommended material, without question.